When you’re multitasking like mad, one monitor doesn’t provide enough real estate to display every open window without many of them overlapping and obscuring each other. For this reason alone, most PCWorld editors and designers use more than one display. Constantly rearranging multiple browser, text editor, chat, and photo-editing windows as you search for the one you need saps productivity and invites frustration. But using multiple displays isn’t a panacea, either. First, you need a graphics card that can support two displays. That isn’t an unusual feature for a desktop PC, but it’s hard to find on older notebooks. Second, multiple video and power cables add clutter to your work environment. Third—and most important—a gap between the displays is inevitable, no matter how carefully you arrange them. Even the narrowest bezel will create a blind spot as your mouse pointer crosses from screen to screen. So the new 29-inch, ultrawide displays featured here—each delivering a resolution of 2560 by 1080 pixels on a single screen—are a welcome addition to the market. They’re just the ticket for productivity apps, and they’re not bad for gaming, either. When we ran BioShock Infinite’s built-in benchmark at these displays’ native resolution (using settings of Very High) on a PC outfitted with a midrange AMD Radeon HD 7790 video card, we experienced a very playable frame rate of 41.1 frames per second. Three such models recently passed through the PCWorld Lab: the Dell UltraSharp U2913WM, the AOC Q2963PM, and the LG 29EA93P UltraWide IPS Monitor. Each of these monitors measures 29 inches diagonally, with an aspect ratio of 21:9. That’s much, much wider than the 16:9 and 16:10 aspect ratios you’ll find on more-conventional monitors (or the 4:3 aspect ratio that old-school displays deliver). Each of the models I reviewed incorporates a high-quality IPS (In-Plane Switching) LCD panel that delivers a very wide off-axis viewing angle (an especially important feature when you’re dealing with an ultrawide display). And each screen uses environmentally friendly LED backlighting, which reduces warm-up time, lowers energy costs, and reduces the amount of damaging chemicals that eventually find their way into landfills at the end of a product’s useful life. I liked all three displays, but one delivered more features and performed better than the other two. 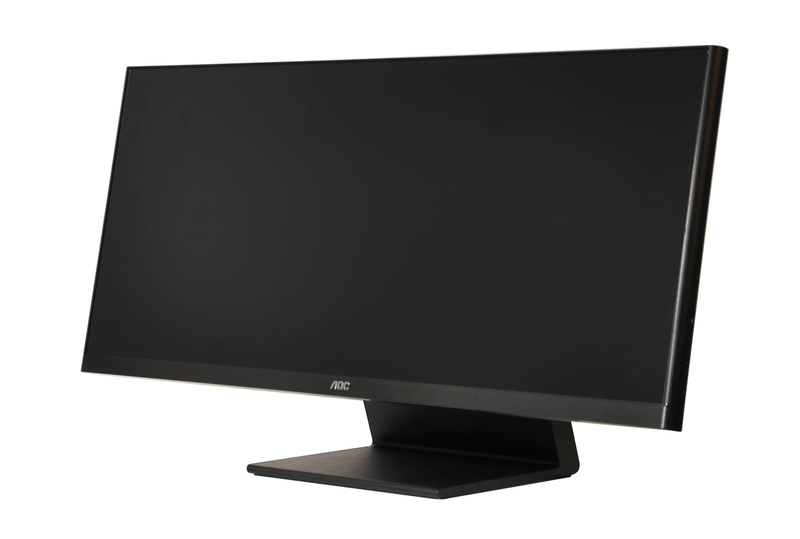 The AOC is one of the most full-featured displays in the group, providing DVI, HDMI, MHL, VGA, and DisplayPort. MHL (Mobile High-Definition Link, in case you’re not familiar with the standard), provides a means of mirroring the display on your Android tablet or smartphone (in some instances, the cable can charge the device at the same time). AOC provides the necessary cable, which has a micro USB connector for the device and an HDMI connector for the Q2963PM.We found that the technology worked as advertised. AOC's Q2963PM is loaded with features, but its display wasn't as accurate as its rival screens. The AOC monitor also supports DisplayPort 1.2 multistreaming, which allows you to chain several monitors together. Not every video card supports this feature, but I successfully tested it with an MSI GX60 gaming laptop. Daisy-chaining is easy: Connect a DisplayPort cable from a video card to the monitor’s DisplayPort In. Run a second DisplayPort cable from the first monitor’s DisplayPort Out to a second monitor’s DisplayPort In, and repeat until you run out of monitors or bandwidth. The AOC supports both ‘Picture by Picture’ and ‘Picture in Picture’ modes and includes the company’s own Screen+ software, which lets you divide your screen into multiple zones. Windows snap to a grid when dragged into a given zone, and you can split the screen in half horizontally, vertically, or both, to make four rectangular zones for email, chats, browsers, and more. The Q2963PM has stereo speakers, but they’re poorly located on the left and right sides of the base, behind the center of the display. They don’t sound terrible, but they fire out parallel to your ears instead of toward them. You’ll be happier using even the most modest set of desktop speakers. The AOC’s stand permits little in the way of ergonomic adjustment: There’s no height adjustment, pivot, or swivel—just a few degrees of tilt. The panel delivered crisp, clean text, and games and movies played smoothly; but it rendered stark whites with just a hint of yellow. You won’t want to use this display for mission-critical tasks such as photo editing. Dell’s UltraSharp U2913WM offers the greatest degree of ergonomic flexibility in this group, with several inches of height adjustment and a stand that both tilts and swivels. It also supports DisplayPort 1.2’s daisy-chaining capabilities, and I had no problem getting that feature to work. Dell wins this competition by a wide margin, thanks to the U2913M's excellent performance, full feature set, and competitive pricing. The monitor has all of the inputs you might need: Mini DisplayPort, DisplayPort In, DisplayPort Out, Dual Link DVI, VGA, and HDMI. You’ll also find a handy USB 3.0 hub for connecting peripherals such as mice, keyboards, and external hard drives. Dell provides a Mini-to-Standard DisplayPort cable and a USB 3.0 cable in the box. The U2913WM’s IPS panel afforded great off-axis viewing, with very little color shift when my eyes moved left or right from the center of the screen. Colors were saturated and pleasing, once I figured out how to turn off the annoying Autocolor feature that tries to optimize the screen settings according to the application being used. I found Autocolor to be a little freaky, to be honest. After looking at a test photo, I would click a browser window—and the whole screen would turn a pinkish color. Tap back to Photoshop, and the colors would return to their prior values. On a display designed for multitaskers, having automatic color shifting turned on by default seems distinctly odd. On the positive side, text was easy to read, even at small type sizes, and movies and games played back smoothly. When I ran DisplayMate’s black-screen, stuck-pixel test, I encountered two stuck subpixels: one blue and one red. They weren’t in the same area of the screen, and I could detect them only when running the test screen. These should be covered by Dell’s warranty (you can read the details at Dell’s site). Dell’s Display Manager application, like AOC’s Screen+, lets you select zones that windows snap and expand to as you drag them. The apps work pretty well, but they take some getting used to. PCWorld recently rounded up a number of third-party window managers that you might find to be a little more full-featured (see “Crisp up your desktop with a window manager utility”). The 29EA92P has the most stylish design of the three ultrawide displays I evaluated. Though its thin black bezel looks similar to those on the AOC and Dell models from the front, the back of the case is white plastic and its edges and stand are chromelike. The stand is attractive enough, but it possesses a very limited range of motion, with just a few degrees of tilt. You can’t adjust its height, and it doesn’t swivel or pivot. The speakers integrated beneath the front edge of the screen sound considerably better than the AOC’s built-in speakers. But as I mentioned in my AOC review, you’ll be happier with even modest desktop speakers. LG's 29EA93P is pretty enough, but the absence of support for DisplayPort 1.2 multistreaming holds it back. The 29EA93P provides multiple connection options, including dual-link DVI, two HDMI ports (one of which supports MHL mirroring of an Android device), VGA, and full-size DisplayPort. Unlike AOC and Dell, LG doesn’t support DisplayPort 1.2 multistreaming on this model. The company provides dual-link DVI, MHL, and USB 3.0 cables in the box. Being an IPS panel, the 29EA93P provides generous off-axis viewing angles, exhibiting very little in the way of color shift or loss of contrast when your eyes leftward or rightward from the center of the screen. Video and games played well, colors were well saturated and pleasing, and text was easy to read, even at small point sizes. All of these displays performed well, with wide viewing angles, good text legibility, and windows management features for taking advantage of the extrawide screens. For folks who want to use their extrawide screens to handle multimedia, the LG with its MHL support and decent built-in speakers would be the best choice. 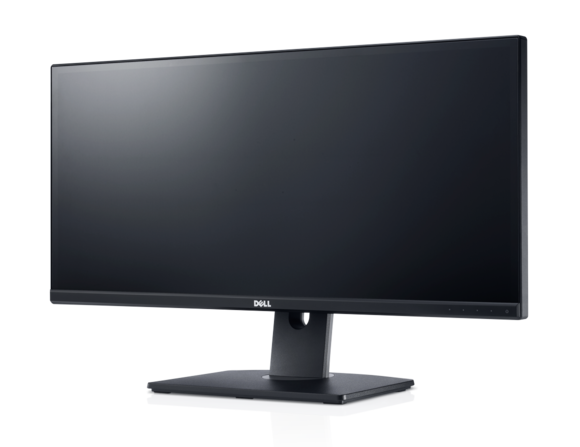 The Dell would be better for users who want to daisy-chain monitors or adjust the height and position of their displays without using risers. The AOC is a fine monitor, but its colors are a little lackluster in comparison to those on the other displays, and its speakers are just crappy. LG's 29EA93P is stylish and it's equipped with pretty good speakers (for a monitor, that is). But for the price, we expect to see not just DisplayPort support, but support for DisplayPort 1.2 multistreaming. Dell consistently produces great monitors, and the U2913WM is no exception, although we don't care for the Autocolor feature that "optimizes" the display for the currently active application. This display isn't as accurate as some other ultra-wide displays we've tested, but it's also priced much lower than professional-grade monitors.